Daniel Mansur explains the challenges he faces as a Group Leader in Brazil. 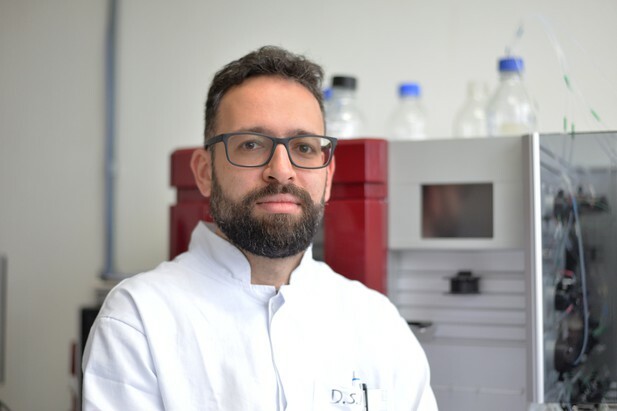 During a postdoc at Imperial College London, Daniel Mansur performed the work that resulted in him being joint first author on a paper that identified a protein complex used as a DNA sensor that recognizes cytosolic DNA and initiates an immune response. By the time that paper appeared in eLife in 2012 he was facing new challenges running his own lab at the Universidade Federal de Santa Catarina. Daniel Mansur. Photo credit: José Henrique Oliveira. Do you remember what you were doing when the paper was finally accepted? At the time I was back in Brazil. I’d invited my postdoc supervisor at Imperial, Geoff Smith, over to the Brazilian immunology meeting, and after the meeting he was going to visit my university. We were in an airport going past security, each looking at our phones, checking emails, and then we just looked at each other… of all the places, and all the times when the paper could have been accepted, it happened there. It was fantastic. At that point in the airport, did you have a plan for the next five years? Did you know what you were going to work on next? Yes and no. Yes in a way because my work has innate immunity as its core theme. And no because I had moved back to Brazil and I knew that there would be absolutely no chance for me to work on Vaccinia virus. Vaccinia is used as a vaccine vector and is very useful to understand host/virus interactions but it has not much direct medical relevance. Brazil is horrendous for basic science, so it is very hard to get funding. So I changed to Dengue, which is a big problem in Brazil and has lots of very interesting “unknowns”, so although I still do basic science it’s with Dengue as a virus model. Also, the field of DNA sensing has become really competitive. There was absolutely no chance I could compete while based in Brazil – it would take me too long to do the experiments. Mainly infrastructure. I have a PhD student who’s spending a year in Cambridge – for instance, she buys antibodies at night and has them by the next morning. I have to wait six months, and I pay up to 10 times more for them. That happens with most reagents. The other thing is that in the UK and the US science is driven by postdocs. For us in Brazil, PhD students drive science. They learn quickly, but they’re less experienced and it might take two years for them to be completely on top of everything they do. I think this is absolutely normal, but it sets you back. What is the focus of your lab’s research? We are mainly interested in how cells quickly react to infection – in particular, how cells sense viruses and the first wave of responses from those cells. We are also very interested in how viruses counteract this “cell-intrinsic” immunity. Most of the time we use flaviviruses as models but also work on other viruses (or even other pathogens) depending on the questions we want to answer. How do you keep track of what all the students and postdocs in your lab are working on? I have meetings with them every week, and I try to coach them independently. To me probably one of the most, if not the most difficult thing about becoming a PI is to know which kind of person each student is: so there are people who need micromanagement, and there are people who you have to give freedom to or you’ll completely destroy them. I hate micromanagement, so in the beginning I try to let them be quite free, but some people need a little bit more detail and instruction on what to do. How you come up with the ideas for the projects your lab works on? So I try to get as much input as I can from students and postdocs, but in the end the main ideas still come from the PIs in the lab. I share the lab with another PI, Andre Báfica, who studies TB. I tend to think more about the things happening inside the cell but he’s an MD and he tends to think, on the top of the intracellular things, about the bigger picture of the disease and that is very useful. So I usually discuss ideas with him and other colleagues and collaborators. Many of my collaborators are people I’ve worked with before who I’ve just kept doing stuff with. Of my collaborators in the UK, certainly 90% are people who I knew before. For example Brian Ferguson, who was a postdoc at Imperial when I was there and was one of the authors on the eLife paper, has been on many of my papers because we work together quite well and conversations with him are always a good source of ideas. In fact all the four postdocs who worked at Imperial in the same office with me have their own groups elsewhere and we still have collaborations. What is most challenging about working in a collaboration? Exactly, though I can do some experiments more easily than my UK-based collaborators. For instance we can work on Dengue virus. Dengue is classed as a biothreat in the UK, but in Brazil it’s just Dengue! Do you have any advice for people who are looking to set up collaborations? I think the best ones arise naturally. Maybe you need a collaboration to solve a particular problem, so you’ll look for someone else with that particular set of skills. But creating projects from the beginning is much more exciting, and those will arise naturally. The more people you know, the more chances you have… it’s just about staying in contact with people. Why have you published your most recent manuscript as a preprint? It has to do with everything we talked about before. Let’s say the paper that we put in a preprint is competing with someone and we actually have the same story, the same set of data. In a journal, the editors might ask both groups for exactly the same sets of extra experiments. But then, the other group that’s competing with me works at Stanford or somewhere like that. They’ll order everything they need to do the experiments, and the next day three postdocs will be working on the project. If there’s something that I don’t have in the lab, I have to wait six months before starting the extra experiments. At least with a preprint the work might not be complete, but people will know what we did. Why didn’t you use preprints earlier? At first, I was very sceptical about them. And then I went to the bioRxiv website to see which journals accepted preprints, and it was basically every journal. I was surprised. Some of the top journals were even encouraging people to put preprints online. The mentality has changed. What do you like about preprints? I think a preprint is one way we can change the peer review process. The paper that ended up in eLife was delayed for three years by peer review. Three years! The paper for sure was much better when it was published, but the take-home message was exactly the same as it was at the start. And for preprints there’s a second level of evaluation that is interesting. Usually with top brand journals lots of people take the paper at face value, because they judge it by the journal. And they even judge the person who did the research by his or her ability to publish there. But you shouldn’t take a paper at face value and the preprint gives you that opportunity. We received lots of feedback on our preprint that made the paper more solid and might save us some trouble during peer review (we’ve submitted the paper to a journal now). In fact the only argument against preprints is that it’s not compatible with double-blind peer review, which is how I think papers should be reviewed. Why do you prefer double-blind peer review? Do you think single-blind review is biased against particular researchers? I think it is there is bias in lots of different ways, even if it’s at a subconscious level. For instance, this has been shown for gender. Brazil’s in a very difficult situation. When I went back we were much more stable. The investment in science was on the rise, so I was able to secure important grants from Brazil. One in particular is responsible for paying most of the people in my lab, and the part of that grant that pays for reagents from the second year on has been cut by 75%. So planning five years ahead is very difficult. Of course I make efforts to look for other sources of money. My other idea is to move as much as possible into computational biology and bioinformatics to be less dependent on infrastructure. That’s not easy because I’m not a bioinformatician, and I like to see the things in the wet lab. What advice would you give to someone who’s just started up their lab? Try to be independent as much as possible. Try not to be kept away from the bench, if you can. Say no to bureaucracy, that’s important. Young people should not be in admin roles. Say you can do other stuff, but you should not assume any admin position. That’s the best advice I would give.